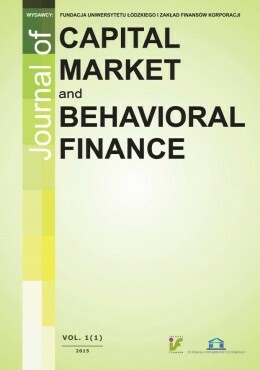 „Journal of Capital Market and Behavioral Finance” to czasopismo wydawane w Katedrze Finansów Korporacji na Wydziale Ekonomiczno-Socjologicznym Uniwersytetu Łódzkiego. a) Zagadnień finansowych: rynku kapitałowego, bankowości, rachunkowości zarządczej, rynku finansowego, kursów walut, transferu technologii, ekonomii rozwoju. b) Zagadnień mikroekonomicznych, związanych z małymi i średnimi przedsiębiorstwami. The volume of publication, taking into account the editorial requirements, should be between 10 and 15 pages. Select an option: mirror margins. paper title: centered, Times New Roman font, bold, 12 pt e.g.Is Corporate Income Tax Harmonization Possible in an Enlarged European Union? Mathematical text (centered), please compose in the equations editor. Any formula numbers should be aligned to the right margin. e.g. A reference to the literature in the article text, please write in parentheses, as in the example below: (Name year of publication, page number) e.g. List of references at the end of the paper in alphabetical order, without a range of pages. Diagrams must also be sent as separate files along with the data (in MS Excel format). Uniwersytet Łódzki, ul.Rewolucji 1905 r.